Minecraft mod maker iChun has released Tabula, a mod that enables the creation of models within the game. IChun doesn't say much about the "in-game Minecraft modeler," although he did put up a brief video on YouTube showing the mod in action. Its UI is perhaps not the most intuitive ever, but iChun said it's based off the Techne mod by ZeuX and r4wk, and functions in a very similar fashion. It's meant as a replacement for Techne (and can open Techne files), but not as a "proper replacement for third-party modelers such as Blender or Maya." 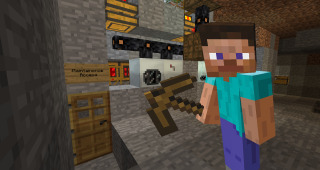 Tabula requires the Minecraft Forge and iChunUtil software to operate. It imports models directly from Minecraft, and exports Java code for modders. Survival Multiplayer (SMP) compatibility is in the works, and future compatibility with 1.8 blocks is also a possibility. And if that sounds like a good time to you, you can learn more (or just grab the thing and play around with it) at ichun.us.